This article presents how we can generate a script to truncate all tables/all tables except few specified tables/specified tables of a Database in Sql Server. One of major the problem with table truncation is, we need to remove if there are any foreign key’s defined in other tables which references the columns in the table to be truncated. So to truncate a table we need to first remove all the foreign key references then truncate the table and finally add back the removed foreign key constraints. We can use the below script to generate the script to truncate all the tables of a database. Disclaimer: As TRUNCATE table removes all the records from the table permanently. So, think twice before executing the truncate table statement. By default the above script generates the script to truncate all the tables of a database. If need is to truncate only the specified tables then uncomment the line number 15 (i.e.–AND ST.NAME IN (”)) in the above script and mention the list of tables to be truncated. And if requirement is to truncate all the tables except few tables, then uncomment only the line number 14 (i.e. –AND ST.NAME NOT IN (”)) in the above script and mention the list of tables which shouldn’t be considered for truncation. ALSO READ: How to find all dependencies of a table in Sql Server? ALSO READ: How to find referenced/dependent objects (like Table, Function etc) of a Stored Procedure/Function in Sql Server? 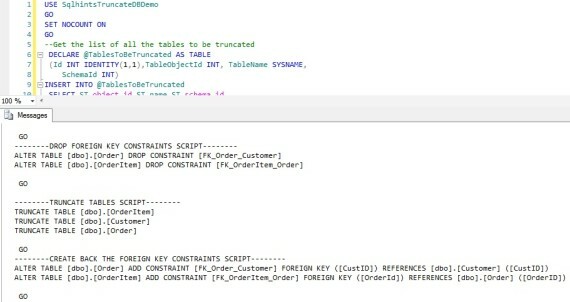 Below script creates a database SqlHintsDemo and adds to tables Customer and Order to it. Here foreign key constraints FK_Order_Customer defined on the Order Table CustID column refers to the CustomerId column of the Customer table.